My Top 10 Math Apps post is by far my most popular post, so I thought I'd add my Top 10 Literacy Apps. I love using apps to give my students extra practice because it is so motivating for them. 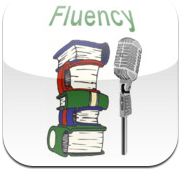 FLUENCY: This fluency app is my favorite! I want to hold students accountable for practicing their fluency passages, but I don't always have time during the school day to listen to all of them. Enter this wonderful app! First, you connect it with your Dropbox account. Then, you send scripts to the app. Next, you have students record themselves reading the script for one minute and send their recording to your computer through Dropbox. Last, you can listen to all the recordings at your own convenience. And students actually ask to keep recording themselves because they want to send me their best reading (kids asking to do repeat readings...yes please!). 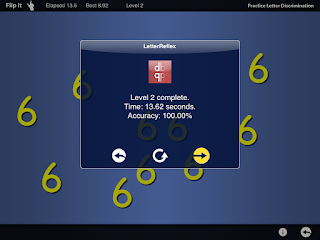 LETTER REFLEX: Do your students have problems with letter reversals? I always have a few that really struggle with this, especially b, d, p, & q. This app works with them to overcome their reversals. It works on letters and numbers. It's not an app I use with every student, but it's great practice for those few that need targeted support to fix their reversals. 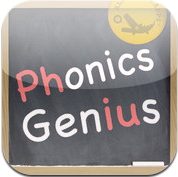 PHONICS GENIUS: I admit I have a lot of phonics apps! This one is one of my favorites though! 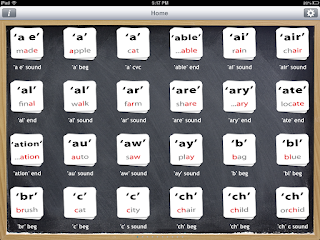 I find a lot of phonics apps are too young for second graders. I need more than just basic short vowel and silent e words. 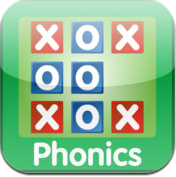 This app covers tons of phonics patterns (over 200)! Overall, it's a fairly basic app, but it covers every pattern I need to teach. It's organized by pattern so I can target exactly what I need to for individual students. 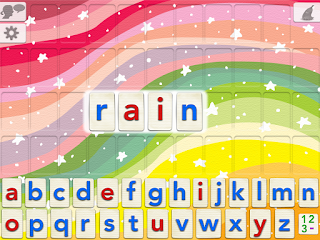 Once you select a phonics pattern it shows a word that has that pattern highlighted and reads the word to you. When you click on the word it goes to the next word. 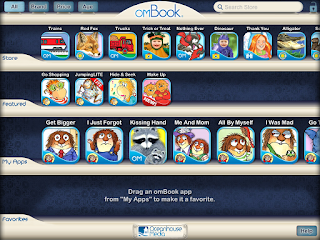 There is also an option for students to record themselves reading the word. You can even mark words as "favorites" if you want students to review multiple patterns. 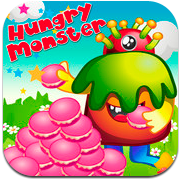 HUNGRY MONSTER BUILD WORD: This app and the others in its family (Find Vowel and Word Family) are my students' favorite apps for practicing phonics! They are so engaging! 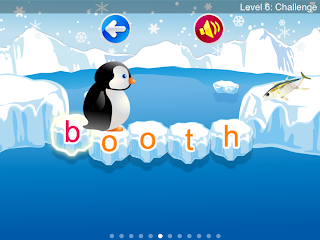 There are five levels of increasing difficulty (short vowels, long vowels, bossy r's, other vowel teams, and challenge). When you choose a level you hear a word and have to choose the beginning sound and ending sound to make the word you heard. If you're right you feed the Hungry Monster! 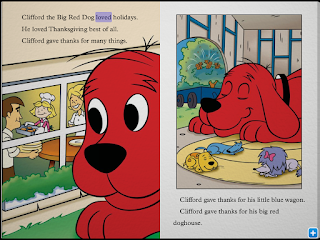 OCEANHOUSE MEDIA: I love using audio books to model good fluency. I have a lot of books and CDs in my class, but interactive e-books on the ipad are more convenient (no more looking for the matching CD for the book) and I like how it highlights the text (some of my struggling readers have a hard time following along). 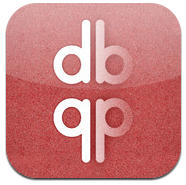 You have to buy each audio book, but this app keeps them all organized in one place. They offer many different series and I've been able to catch a good number of sales. 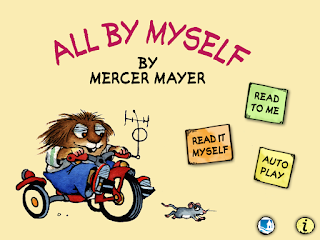 I've bought most of the Little Critter, Berenstain Bears, and Dr. Seuss books. 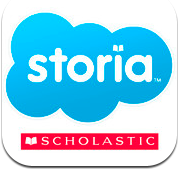 STORIA: This is another app for interactive e-books. This one is nice because you get some free books just for signing up! 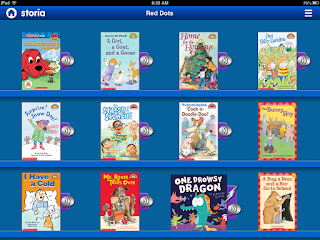 This app is free through Scholastic and I use my bonus points to buy books. There is a nice variety of books to choose from. Not all of them will read to students though, so if that's important to you make sure you look closely before you buy. Sometimes I hook my iPad to my projector and use these stories as read-alouds. 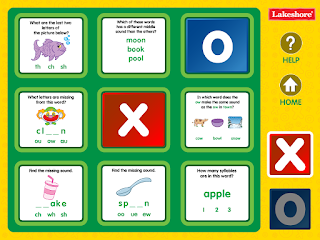 PHONICS TIC TAC TOE: Are you as obsessed with Lakeshore as I am? I LOVE everything Lakeshore and was so excited to see them make apps! I only have 1 iPad in my class all the time and it's nice when it's so easy to have two students play an app without worrying about them getting upset about sharing it fairly. My students love playing this game against each other. I love the variety and quality of questions. Plus, this app is FREE! 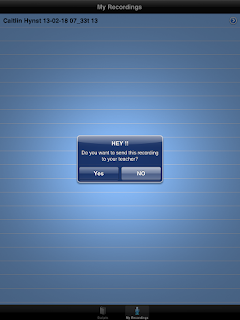 They've also recently come out with some more amazing apps (game show style). WORD WIZARD: This app has a moveable alphabet that makes each letter sound. 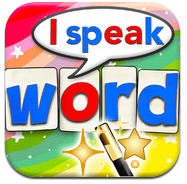 You can use it to make any word. 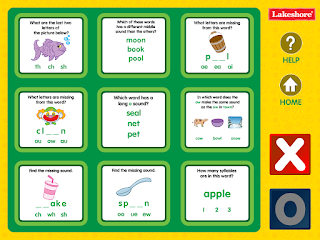 I use it for students to practice their spelling words and to make words that match our phonics pattern of the week. This app also has built in spelling quizzes where you can pick from a list or build your own list. 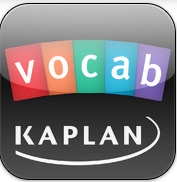 This app is easy to use and engaging for students. 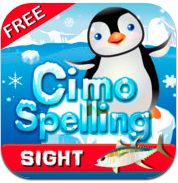 CIMO SPELLING: In this app you help a penguin cross the ice to get to its fish by spelling a word the app says. It's very cute and I like the progression of the levels (short vowels, long vowels, bossy r's, other vowel teams, irregular vowels, and challenge). When you select a level the app says a word and has the letters needed on the ice below (on the challenge level it might also have an extra letter that will not be used). 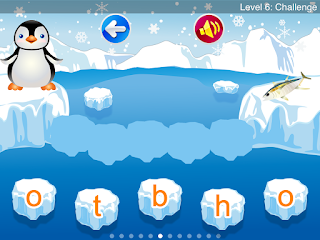 You have to drag the letters to make an ice bring for the penguin to cross. When you get it correct the app sounds out the word. 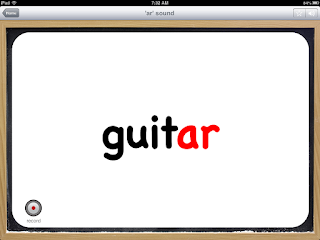 I really like how it highlights the phonics patterns as it sounds out the word. OPPOSITES: This app practices exactly what is says: opposites. 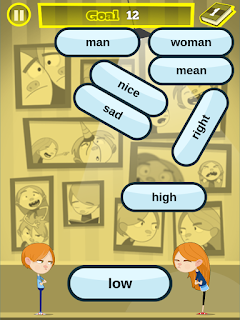 Words show up and you have to match up words that are antonyms. It increases in difficulty with each level. 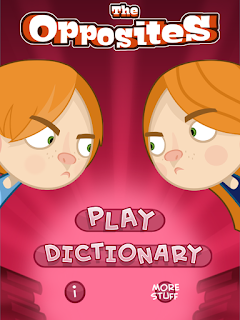 There is also a dictionary feature where it will explain the words used in each level. 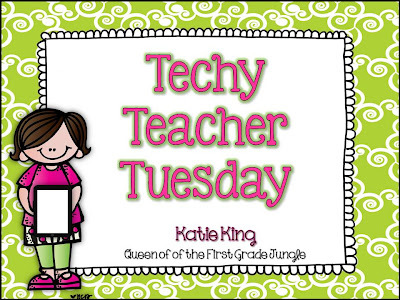 I'm linking up with Katie King from Queen of the First Grade Jungle for her Techy Teacher Tuesday. Wonderful post, Caitlin! I finally got an iPad for my class last week and have been hunting for new apps. You shared a bunch that I have never heard of. Thank you! This is such a great post! Thanks for sharing these apps! I"m downloading that fluency one NOW!! LOVE IT!! Found this post through pinterest and had to check it out! 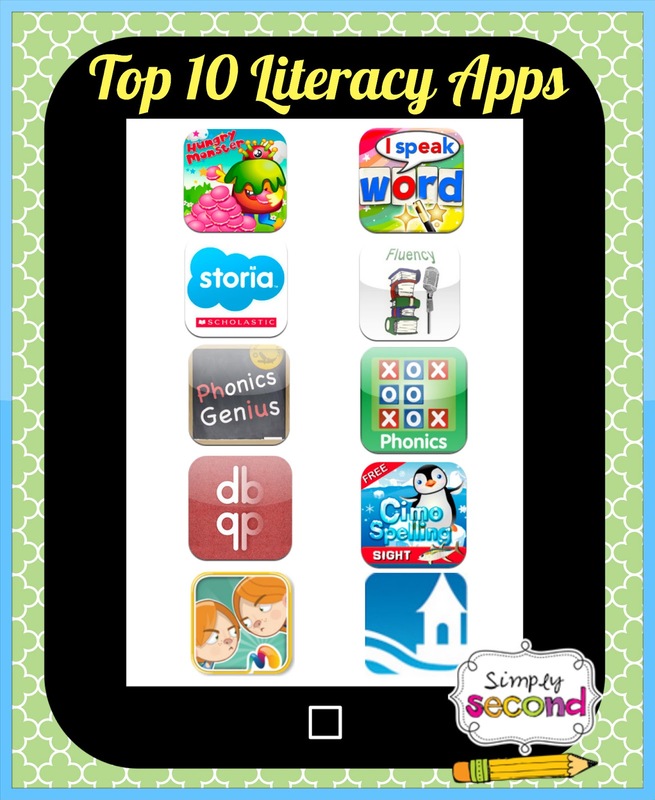 Thanks so much for sharing these awesome apps! We have one classroom set of ipads for the entire school and are constantly trying to figure out what are some good apps for a K-2 building...These apps you shared look perfect! Can't wait to check them out!! I am happy to be your newest follower! By the way we have the same name and spell it the same way! So rare to find other "Caitlin's" out there! Have a great rest of the school year! Thank you so much for this. Found you on Pinterest. I home school and my kids will love these. Thank you! 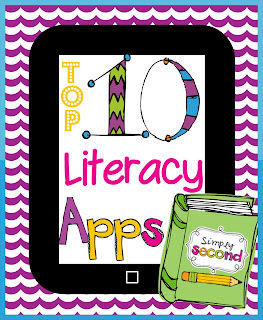 I found your math apps on Pinterest and hunted your blog for Literacy apps. I really appreciate the reviews!! Can I add an app that I have made for teachers? 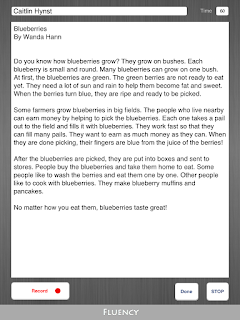 Stream Reading, a reading conferencing app, it records all your sessions, audio of student reading and is able to export the data via printing, email or Dropbox.